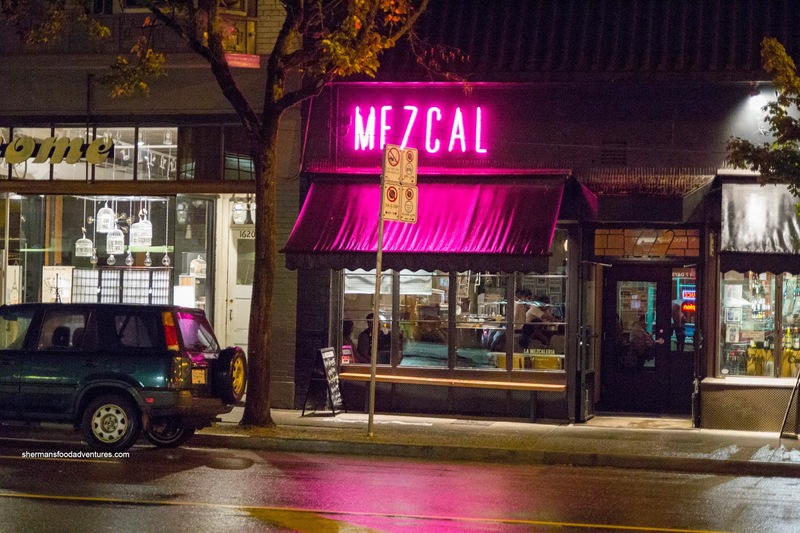 At one point, when locations of Taco Bell and Taco Time had outnumbered true Mexican restaurants, it exemplified the sad state of the cuisine in Vancouver. Fortunately, those days seemed to be in the rear-view mirror, much like a car tailgating along #3 Road. With the increasing number of "as-authentic-as-can-be for Vancouver" joints opening up, we no longer have to accept tatar tots as Mexi-fries. 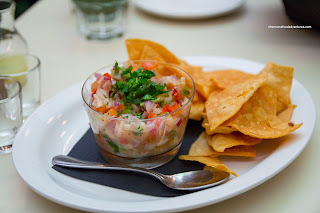 One of the newest places is La Mezcaleria on Commercial, brought to you by the same people as La Taqueria. Due to a mix-up on the first visit, I was ultimately treated to 2 meals with Miss Y as my trusty eating companion. So I'll merely bunch everything into one post. We started with the Pacific Snapper Ceviche consisting of tomato, lime, red onion, serrano peppers and cilantro with a side of freshly-fried tortilla chips. We found the fish tender while still firm. There was a good amount of lime as well as a low rumble of heat. Ultimately, it was light and refreshing. At first, we were wanting some more seasoning, but the salt on the crunchy chips provided that balance. 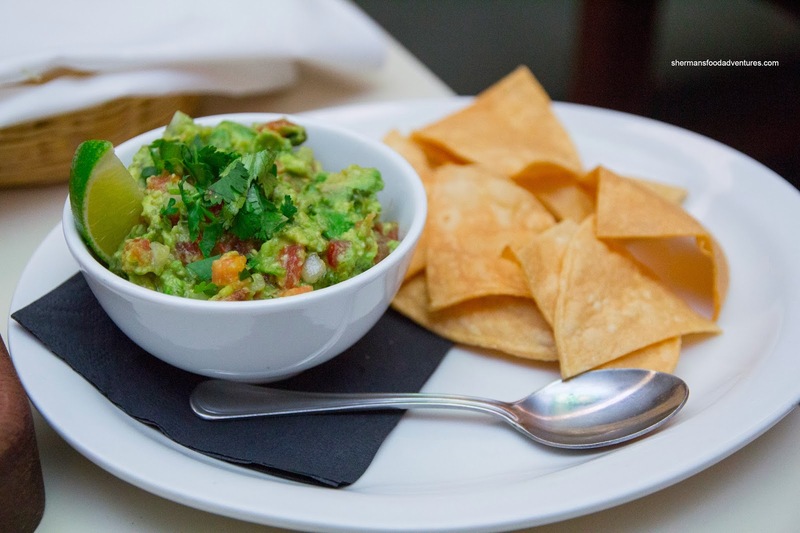 Accompanied by the same chips, our side of Guacamole with ripe avocado, lime, cilantro, onions, jalapeno and tomato was good. Since it was made-to-order, everything was vibrant and fresh. I liked how it wasn't over mixed where there was still some chunkiness. I would've liked to see more acidity though (but there was a wedge of lime). 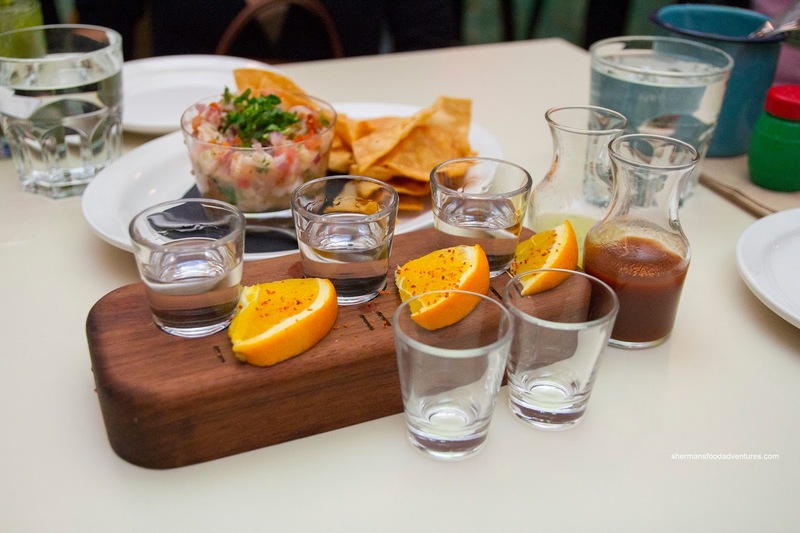 Of course we couldn't eat at a place named La Mezcaleria without trying the Mezcal Flight. I'm not too familiar with Mezcal, so don't expect an in-depth analysis. What I do know is that Mezcal and Tequila are both made from the agave plant, yet with Mezcal, it is roasted (which imparts a smokier flavour). So from left to right, I had Mezcal from Coyoacan, Espadin and lastly an Aged Mezcal. It was served with spiced orange wedges, sangrita and lime. You're not supposed to "shoot" the drinks, rather, it is best to sip with alternating samples from the sangrita and lime. I quite liked experimenting to create different flavours. 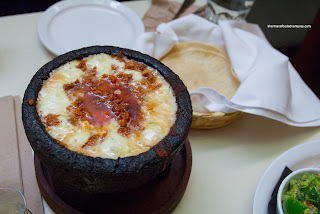 Probably the most interesting dish we tried was the Queso Fundido with chorizo. Essentially a cheese fondue, it was served in a volcanic rock molcajete and accompanied by soft tortillas. Suffice to say, this was extremely cheesy and stringy. And yes, by the visuals, it was pretty greasy too with the moist and flavourful chorizo. Onto some other mains, we had the Pirillada consisting of grilled short-ribs marinated in a home-made pasilla chili sauce, chorizo, nopalitos, toreado peppers and green onions. The moist and flavourful short ribs exhibited a nice char and was quite mild, salty and slightly sweet. Miss Y remarked it tasted like somewhat like a smokier Korean short ribs. The side of nopalitos (or cactus) was remarkably not slimy and had a nice hit of lime and spice. We liked the meaty and mildly spicy chorizo on the side. 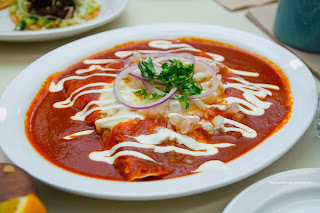 We also sampled the Chicken Enchilada topped with red tomato salsa, onion, cream and Mexican cheese. The star of the dish was the wonderful roja as it was slightly smoky, zesty and layered with flavour. It started off sweet and ended with a low rumble of spice. The chicken itself was moist and lightly seasoned. 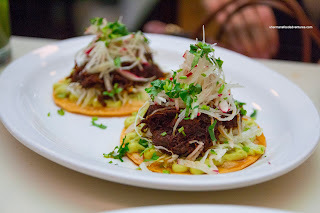 Saving the best for last, we really enjoyed the Tostadas de Pato made with duck confit, guava, fruit mole sauce, chayote and radish. These were very good with a crunch from both the corn tortilla and veggies. The duck itself was smoky, sweet and mildly spicy. It was suggested we eat them by hand, but there was so much stuff on top, it was pretty difficult. The fruit mole added a nice creaminess which brightened up the flavours. And of course we had to try some Tacos (since they are the same people as La Taqueria). From left to right, we had the Lengua (tongue), Carnitas (pork confit), Asada (flank steak) and Cachete (beef cheeks). 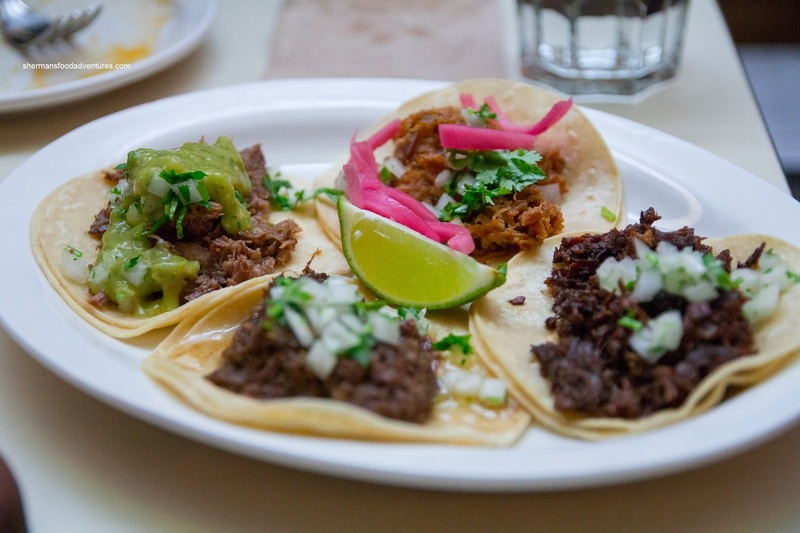 The tongue was moist and fatty while the carnitas was tender with depth and nicely accented by the pickled onions. 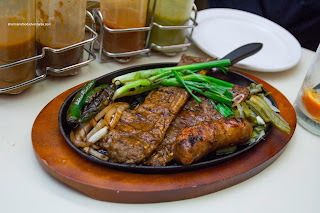 The asada was smoky with caramelized flavours. 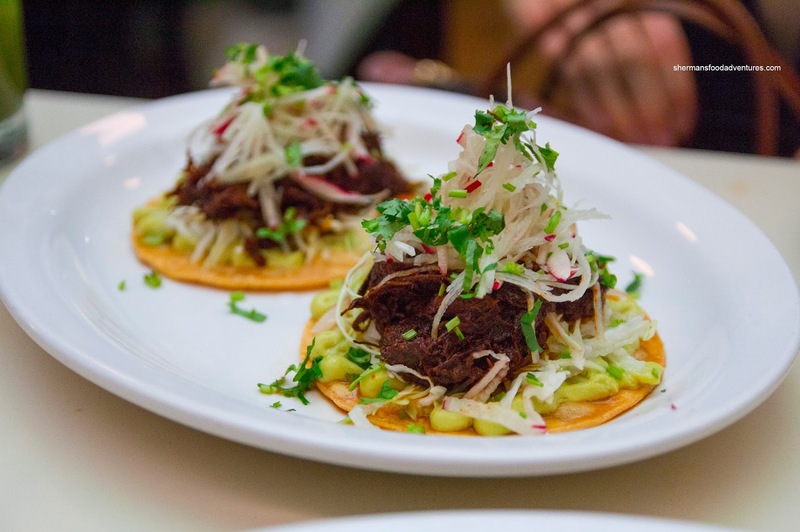 Lastly, the beef cheek was also moist exhibiting natural flavours from the braise. 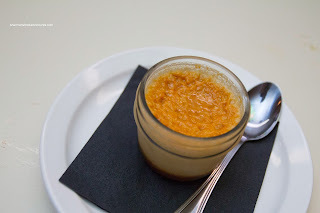 For dessert, we shared the Flan which was made with condensed and evaporated milk, hence the dulce de leche-type consistency and sweetness. Although it was on the denser side, we enjoyed it nonetheless for its richness and controlled sweetness. Even the caramel on the bottom wasn't stingingly sweet, rather, it was smoky and a touch bitter. Overall, for all the dishes we tried, the meal(s) were good. The thing we noticed the most was the freshness of all the ingredients (which never hurts). 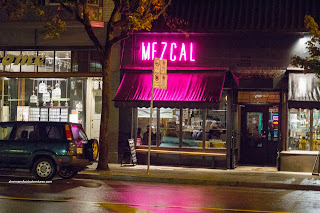 And also, if you are a fan of Mezcal, there is probably no other place in Vancouver that can rival La Mezcaleria.